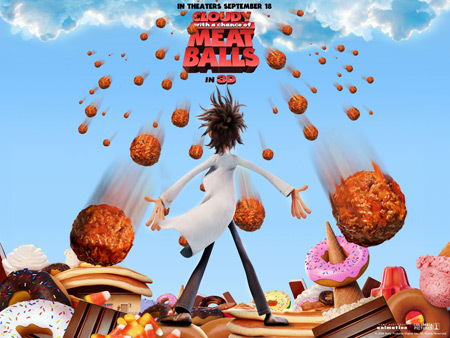 Cloudy with a Chance of Meatballs -- a movie based on the children's book of the same name by Judi and Ron Barrett -- might very well be the next Ratatouille for mini foodies and their parents. I don't think they'll be calling in Thomas Keller for a culinary consult, but I do know that Cloudy... is one of my husband's favorite childhood books, and I think a movie treatment is genius. I was initially a little nervous to hear the movie wasn't coming from Pixar. However, after watching the Sony trailer, my nerves are totally dispelled, and I can't wait to see it. Clearly, it won't be exactly like the book. In fact, it appears the writers used the book more as a jumping off point rather than copying it verbatim, which makes sense because the book is really just a grandfather regaling his grandchildren with stories about a town that would easily beat out San Francisco and New York for best eating. The movie takes this concept a step further by inventing individual characters, like Flint Lockwood -- the inventor who is responsible for turning his town into a culinary mecca with all sorts of foodstuffs falling from the sky -- and other townspeople, who get caught up in the euphoria and insanity of experiencing manna in a non-biblical sense. Cloudy with a Chance of Meatballs is due out September 18th, but in the meantime, all this talk of meatballs has gotten me hungry, so here's a roundup of my five favorite meatballs in the Bay Area. You might want to think about dining at one or all before seeing the movie to combat any meatball envy you're sure to experience during the movie. Better yet, see if you can sneak some meatball action into the theatre with you. Meatballs available only on Mondays. Wood-oven baked meatballs available from the lunch menu. Neapoletan meatballs in sugo only at their California Street location. Meatballs in a spicy tomato sauce available from their antipasti menu. The vietnamese meatball sandwich -- bánh mì -- is a perfect storm of flavors. If you want to make your own meatballs, I've found that the recipe Simply Recipes adapted from A16's original to be quite wonderful.